Kenny spoke for just under 15 minutes. TAOISEACH ENDA KENNY says that his party’s re-election pledge to the Irish people will focus on “three key steps” . Speaking at the opening of his party’s two-day Ard Fheis at Citywest, Kenny said that the three elements will be to ‘keep job creation a priority’, ‘ensure that work pays’ and to ‘improve the daily lot of all the people’. The Taoiseach took direct aim Fianna Fáil during his speech saying that its plan for recovery during their time in government was a “total disaster”. Kenny pledged to create 200,000 new jobs over the course of the next five years, something he said would include jobs for emigrants that Fianna Fáil had ‘driven away’. Referencing Fianna Fáil’s Ard Fheis at the same venue last weekend, Kenny said he “heard some incredulous comments” coming from the party. He went on to say that its previous time in government delivered “a disastrous plan”. “Now is not the time to take risks with our country’s recovery,” the Taoiseach said, adding that we are currently operating in an “uncertain world”. 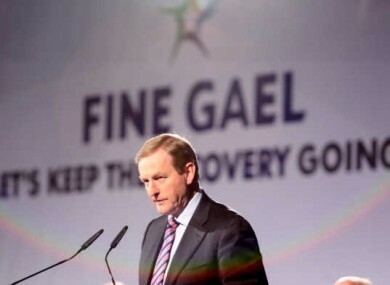 Kenny speech focused heavily on the economy and he repeatedly stressed that his party would “keep the recovery going”. Returning to the main opposition party, Kenny pointedly said that the “the people had voted them out” in the wake of the 2010 bailout. Earlier in the evening, Finance Minister Michael Noonan was asked about Fianna Fáil and the potential for a coalition with Fine Gael. He said that it was something his party was not considering. Our proposition is that it was the present government that initiated the recovery and developed it to the point that it’s growing at 7%. Our proposition to the public is that they re-elect the current government and we’re not thinking beyond that. Noonan says he’s not thinking about post-election seat numbers and whether the current government will have enough to be returned. “We’re not into speculation, we’re going to make sure during the campaign that the numbers do stack up,” he said. Earlier, the hall where the Taoiseach was speaking was evacuated when a suspect cartridge was found behind the stage where he was due to speak. The security alert saw gardaí and sniffer dogs search the room before it was declared safe. Email “‘Total disaster’: Enda lashes Fianna Fáil as he rallies the troops”. Feedback on “‘Total disaster’: Enda lashes Fianna Fáil as he rallies the troops”.